Data source: Centre for Health Protection, Department of Health, HKSAR. The virus EV71 is a common cause of HFMD. 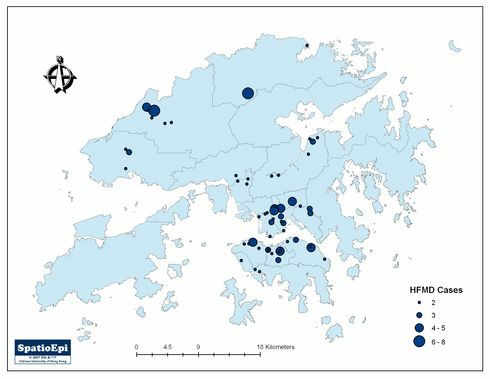 According to the Centre for Health Protection, the number of reported HFMD cases in Hong Kong in the first half of 2008 has exceeded the annual total in the past decade. Similar increases have also been reported in some parts of Mainland China and neighbouring regions. 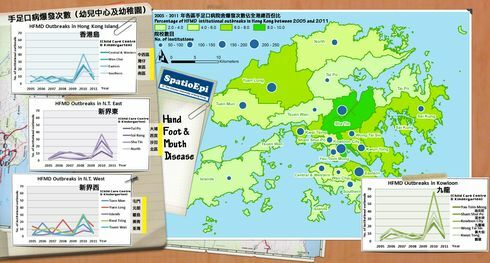 Using graduated symbols, the map shows the distribution of HFMD cases recorded in outbreaks during the period from 9 May to 19 June 2008. Occurring mostly in primary schools and nurseries, the outbreaks have affected predominantly children and infants. HFMD is different from an unrelated condition bearing a similar name, the Foot-and-mouth disease (FMD), which is another contagious viral disease of cattle and swine. Hand, foot and mouth disease (HFMD) occurs commonly in infants and children. It is an infection caused by a group of viruses called enteroviruses. Of these Enterovirus 71 (EV71) is a common causative agent, alongside other viruses like Coxsackie virus A. Patients with HFMD present with fever, blister-like eruptions in the mouth and/or a skin rash. Complications arising from HFMD are rare though occasional fatal cases related to EV71 infection have been reported. EV71 infection is associated with a higher incidence of neurological complications including encephalitis. HFMD is spread from person to person by direct contact with infectious virus. Infectious virus is found in nose and throat secretions, saliva, exudate from blisters, and stool of infected persons. Currently there is no vaccine available for HFMD. Good personal hygiene practices including hand washing can lower the chance of infection. Good environmental hygiene such as cleaning of contaminated surface, toys, soiled items and well ventilated environment can help to reduce the chance of transmission.